Darren and Libby arrive at the flat they will be living in. Catherine telling Stonie they shouldn't see each other anymore. Stonie is furious and when Catherine says she's sorry, Stonie asks her why she should be sorry when she's the one calling it quits. He tells her to leave and as she goes, he tells her that he blames her decision on Sarah having spent an hour before hand chatting to her, she then comes in and breaks it off with and that he wrong about her making her own decisions. Catherine walks out of the kitchen and into the dining area and finds Sarah drinking a coffee. She asks her how things went and they then leave leaving Stonie in the kitchen looking upset. Libby is trying to study but loses concentration when a baby starts crying next door. Darren comes in with a chair, a table and some Fish and Chips. Libby tells he's done really well and that what matters is them being together and muses that things could be worse. Sarah tells Catherine to stop giving herself such a hard time as it happens to all of them at some point. Catherine replies that it doesn't make it any easier but Sarah tells her that she couldn't go on seeing Stonie just to spare his feelings. Catherine says she should have called it quits ages ago and now has to figure out where she's sleeping tonight. 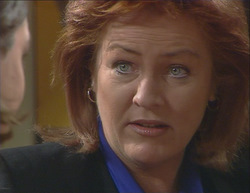 Sarah offers her a room at Number 30 and tells her that Luke has gone away for a couple of days. Catherine accepts and asks for a hug. Sarah tells her that Stonie wouldn't feel so bad if he could see how hard it's been for her. Angie comforts Stonie as he tells her he can't imagine not being with her now and should have seen it coming as he should have been more prepared. He thought if he hung around, Catherine might have come round. Angie tells him she thought she'd she some changes but never thought it would come to this. Stonie says he thinks there's no point in hanging in Erinsborough and tells Angie he may as well hit the road with her and Toadie. After he walks off, Angie looks pleased with herself. Next morning, Karl comes into the house carrying his newspaper and finds Mal up early. When Mal tells him that he's picking up Darren, he realizes that he knows where Libby is. He demands he tell him where she's staying but he refuses saying that he should back until Libby invites them over there herself. Susan comes out from the bedroom and notices the arguing but remains silent. Mal heads out the door as she tells him to eat something decent. Susan heads over to Karl and comforts him. SUSAN: Be patient. I think it's a good thing that Mal knows where she is. KARL:(angrily) I am her father for god's sake. She should be telling me where she is not her brother. Libby is getting ready for school but loud music is coming out from the flat next door so she heads over to the wall and start banging on it. LIBBY: It's 8 o'clock in the morning, will you shut it up? Darren emerges from the bathroom and then says that as soon as he's got the money they will find somewhere else. Mal then arrives to pick up Darren for work. Libby tells Mal about her plans to do the place up and they then all head out the door. Mal and Darren are eating breakfast as Darren doubts whether he will see Susan or Karl today. Angie comes over asks how things are going. 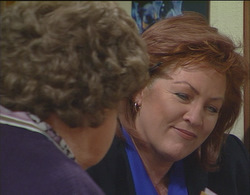 She then tells Mal that Stonie could with his support over the break-up. She then leaves and discussion turns to the flat and how Darren thinks Mal wasn't that impressed with it. He's sure that Libby makes out everything alright but that the neighbours and the noise tell a different story. It's starting to look Darren's stuffed everything up for everyone. Catherine brings her suitcase and is worried Luke will find out but Sarah assures her that he needs the money and will be glad to share the rent. There is then a knock at the door and Catherine answers it to find Angie standing on the step who's not happy about (what Angie thinks) her doing a runner. ANGIE: Seems like it. Taking off without having the courtesy to say goodbye. She's also not happy that she didn't say anything sooner stringing Stonie along like that all this time. SARAH: She wasn't. It's just that people's feelings change. Angie gives her a huge glare. ANGIE(to Catherine): In my day, we do what we could to fix things up before we walked out on them. Catherine thinks that Stonie wouldn't have been happy with the patch up job. Angie demands her key back which Catherine duly gives. Angie storms out. 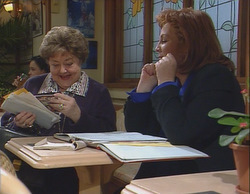 Marlene comes in and sits next to Cheryl and shows her a postcard from Jo. Cheryl muses how at the rate things are going she will lose her family and hopes that Darren sorts himself out soon. She then tells Marlene she's decided to write to Lou and give him an olive branch over their custody battle with Lolly. She wants to sort everything out without putting Lolly through hell. If she doesn't make the first move, nobody will. MARLENE: I'm very glad to know that your gonna set things straight, because I reckon the one that it's been toughest on is you. Sarah and Catherine walk as Catherine tells her that she can't walk out on her responsibilities. She doesn't want to leave Angie or Stonie in the lurch just as Stonie himself walks in. He heads off into the kitchen and Catherine follows him in. CATHERINE: Will you give me a break? CATHERINE: You wouldn't have wanted me to pretend I was in love with you when I'm not. STONIE: Seems like you manged to do that all by yourself. CATHERINE:It's not true Stonie, I like you and I still do. STONIE: What do you want? Do you want your wages, look just speak to mum about that, ok? Right now I'm busy doing your shift. Catherine realises she's no longer working at The Coffee Shop and Stonie tells her to stay away so that she and Sarah can't gloat at him. Catherine walks out. Susan comes home and finds Karl home early and notices that he has Mal's account book. Karl's been trying to find out where Darren and Libby. He wants to go round there and talk to Darren man to man. SUSAN: When are you ever going to learn? KARL: He's got my daughter living God knows where. I'm not suppose to be concerned about her? SUSAN: Has it ever occurred to you that I am concerned about her as you are? KARL: I am trying to protect my daughter. SUSAN: And you will just make things worse. She tells him that they have to let go if they want her to come back as there's no other choice unless they want to risk losing Libby for good. Libby is trying to brighten the place up but thinks that the plants will die anyway. Darren and Mal come in. 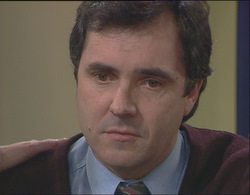 Mal goes to leave but Darren tells him to wait as Libby's coming with him. Darren tells her that the flat is the pits and tells that no one could come home and study in this mess. Libby looks shocked. A few moments later Libby is furious with Darren but Darren is packing their stuff anyway. He tells Mal to give them five minutes and he leaves. Libby and Darren argue but Darren's mind is made up. 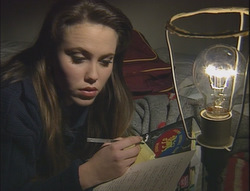 Even if Libby could live here, what about her study? LIBBY: I really don't want to give into what Dad wants. DARREN: Who's giving in? All you doing is what's best for you and your study. LIBBY: You know he's gonna be gloating like you won't believe. DARREN: Well if he wants to give you a hard time, he going to have to go through me first. Make sure he knows that. Karl is about to head off on a house call when Mal and Libby come in with Libby's bags. Both Karl and Susan are pleased that she's returned. Libby tells him not to think he's won anything because he hasn't and does not want anything mentioned about Darren. Mal goes to put the bags in Libby's room and Libby tells her parents that it's time she set the ground rules for a change. Karl heads off on his house call whilst Susan tells Libby that if there are any changes that need to be made, Karl is ready to make them. Cheryl is surprised when she sees Darren sitting at the bar. She wanted him to get in touch today to talk to him. Darren then asks her whether he can move back home. Cheryl tells him that her house is always his house. He tells that anything that happens between Libby and himself is his business. Cheryl tells him that she missed him and was worried. Darren tells her the flat didn't work out the way he planned. Cheryl leaves to pick up Lolly. Mal and Stonie are discussing his break-up with Catherine when walks in with Catherine's time sheet and claims that she is owed the money. Stonie curtly tells her that Catherine's money is in the post and Sarah leaves. During this Mal has been eying up Sarah but Stonie tells him to steer clear of her. 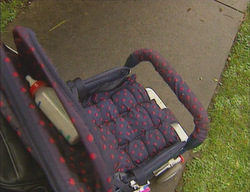 Cheryl is walking along a street with Lolly in the pram when Karl pulls up in his car on his way back from the house call. They discuss the news of Libby and Darren moving out of the flat. 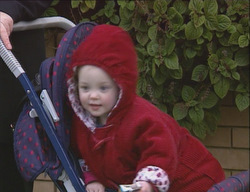 As they do so, Lolly gets out of the pram and onto the other side of the road where she has noticed a dog walking past. Cheryl and Karl both notice this and Cheryl heads across after her without looking and (in a rather ridiculous fashion) is run over by a passing car. As the owner of the dog grabs Lolly, Karl watches all this and gasps in horror.